The No. 01 belongs to the office press series. 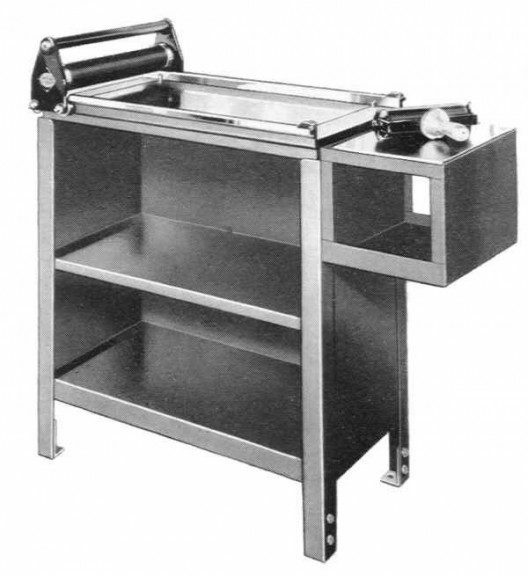 It is a simple galley press with a rubberized impression cylinder not geared to a rack. Cylinder bearers roll on the bed bearers and are supported only by bearings riding the under rail. There are no form rollers but paper grippers were an option. Also called gravity presses or “Showcard” presses, there were several competitors. (Vandercook supplied presses to the Showcard Company, which attached their own nameplate to the carriage.) The Serial number range is separate from other models. Maximum form: 14½ × 26”; maximum sheet: 15 × 32”. There are a mere five No. 01 office presses in the Vandercook gravity press census, but it is likely that more are in use. See the 0, 03 and 099.